The Prism was first tied by Mark Bachmann in the early eighties. He designed it to be an unobtrusive pattern for low, clear water. The Prism works any time of year, but is especially effective during the late fall season after the steelhead have been pressured. Several very large steelhead have been tricked by the Prism. In October, many summer steelhead have been away from the Ocean feeding grounds for several months. They start to forget about the brightly colored marine organisms that nurtured them while at sea, and begin to turn "trouty" in their behavior, looking for things with more freshwater coloration. The Prism turned the trick. Several very large steelhead have been taken on this pattern. It has proven itself very useful as a come-back fly, after steelhead have risen to, but have refused a brighter colored fly. But, it has been very productive on fresh steelhead as well. It is a very good choice as the point fly on a two-fly cast, with a larger brighter colored fly on the dropper. This fly design started as an experiment in coloration when Mark read an article on bird feather coloration, which noted that many colors were not caused by pigments, but by the arrangements of feather fibers into tiny prisms. Rather than reflecting or absorbing certain shades of light, their feathers split the light spectrum by refraction. By changing the direction of a feather in relation to a light source, some birds can change colors of themselves to be either more or less visible to observers. This trait is used to the bird's advantage when attracting mates, or luring predators away from a nest, or when hiding. Many pheasant type birds, such as domestic chickens and peacocks have these kinds of feathers. This family of birds have produced a lot of successful fly tying materials. The most popular of these prismatic feathers is peacock herl, which has been used as fly body and wing material for at least a century. 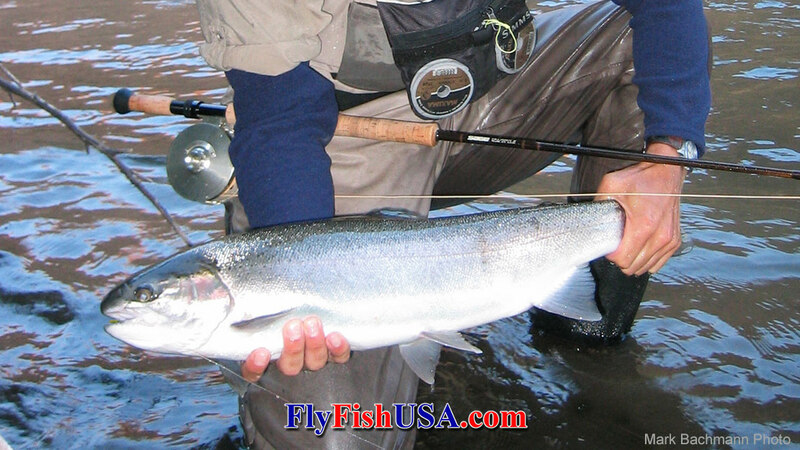 Mark wondered if a steelhead fly tied primarily from prismatic materials would be successful. What evolved was kind of a cross between a grey hackle peacock and a brown hackle peacock which have in the past been very successful trout flies. The answer is Yes. The Prism fly has been very productive, especially during late October and early November.